Got to cover my buddies over at Mad Decent for the PRO-Keds Footprint Series. Enjoy :D.
VJ Tek(Brien) of Rabbit in the Moon invited me over to VJ with him and DBlock(Dan) at the Queen’s Ground stage. I actually met both Tek and Dblock at Coachella. Tek was the one who helped me layout the clips I created for Jason Bentely’s set in the Sahara tent. …Wandered around a bit when I had some free time. We had some pretty nice fire dancers on out stage killing it! Rabbit in the Moon performed an amazing set. It’s really hard to explain… but I would say it’s something mixed with the production of The Lion King(the musical) + heavy bass warped with the underground culture. To get a better idea, feel free to check out the vids on Youtube. Nocturnal was definitely a blast. Crazy how I jumped from being an audience member last year to being on stage this year. Super thanks to Tek and Dblock. From Nike commercial shoots to Tron installation visuals, I must say that July kept my life interesting through the eye of my phone. 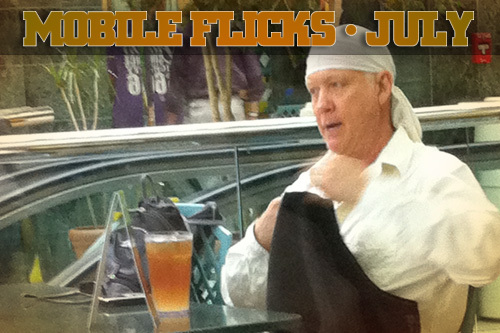 Click the picture below to check out the July’s Mobile Flicks gallery!!! I’m always a bit surprised when I get emails asking me to do the BIGGER stuff. I should kinda be use to it, but I still run around and jump like a little kid when I find out I’m working on something AMAZING!!!! When I first got to San Diego, where Comic-Con was being held, I grabbed some grub at a Cartoon Network themed pizza place! They had Adventure Time all over! The installation was truly amazing. They recreated everything from the movie! Looks like the fans were liking what I made. Jason was killing it throughout the night. I had a blast entering the grid.